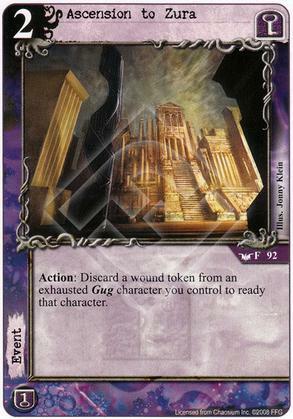 A very specific use this one, you have to have a wounded, exhausted Gug, and something to gain by readying it (as 2 cost to discard a wound is very pricy). I can see it fitting with a lot of other pieces, (Khopesh being an obvious one) but for most decks (even Gug) I can't see this being a good choice. Sadly the ability on gug cards aren't very good, using an event spot to remove a wound from a gug so I can use his ability again seems a bit wasteful. Using the event spot for some recursion or return to hand effect would be a better choice. I could still get additional uses from my gug but also have the option to do something useful instead.